„Colton Turner and his brother Zane ­ who plays guitar in the band ­ grew up in Carlsbad, California. In High School the two brothers got into the Beatles and other sixties Rock’n’roll artists. With the Beatles covering artists like Carl Perkins, it didn’t take long before they discovered the first generation of Rock’n’roll musicians. “It was pretty over once we got hold of a Buddy Holly cd.” says the singer. Pike Cavalero -musician and songwriter grown in the South-East of Spain- has managed to carve himself a niche in the independent music scene offering a concept based on his powerful and real shows. Always accompanied by a distinctive sound and his very noticeable looks, he has succeeded to combine the essential factors in order to get in on some of the most important European and Spanish stages of the classic rock’n’roll scene. Pike starts his course mid 2009, when he decides to join his passion for vintage sounds with his first steps in the writing, recording and production fields into a band, in which alongside veteran musicians -also from the Spanish South-East coast– achieves to obtain his most personal feel. They make their debut as Pike Cavalero & The Gentle Bandoleros in 2010 with the self-produced demo ‘Weekender’, released on December, 21st in digital and CD formats, achievement which obtains as result the support by one of the genre-oriented leader independents, Sleazy Records from Málaga, SP, which releases their first Long-Play ‘Just a Matter of Manners’. After a vertiginous year plenty of shows in clubs and weekenders, and a warm reception by the classic rock’n’roll scene, two new releases came to light, keeping the essence and gaining conviction and personality. ‘Six Shooter Blues’ (7″ Vinyl EP – Sleazy Records – 2012) and ‘Second Round’ (7″ Vinyl EP – Sleazy Records – 2013) just make the artist continue walking the line, strengthening his image. After the release of ‘Torro’ (Sleazy Records, 2014) and the sneak peek 45 ‘Ahora que lo tienes’ (Sleazy Records – 2015), Pike Cavalero, faces a new stage introducing his first record in Spanish, ‘Sin Miedo a Volar’ (Sleazy Records – 2016). A personal bet which not expects nothing more than show his true style but in a different way. 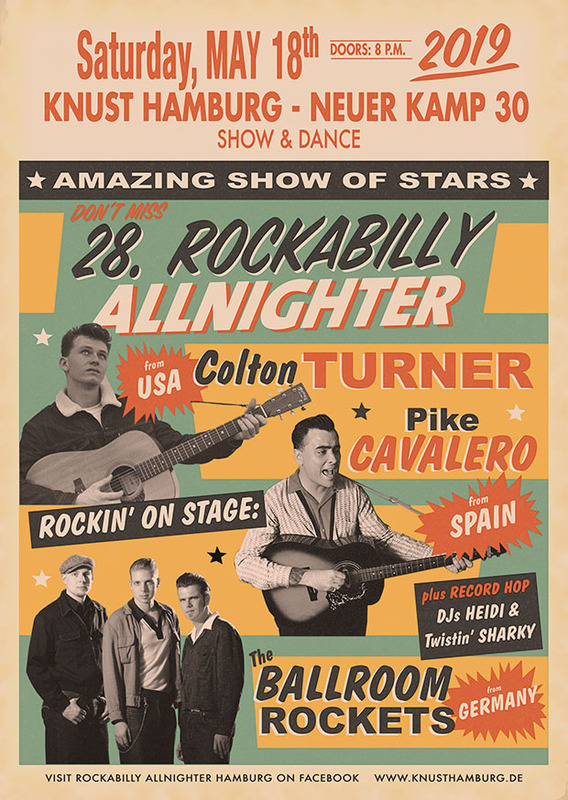 Authentischer Rock´n´Roll, Rockabilly und Rhythm and Blues im Stil der Bands der frühen 50er Jahre Zum Repertoire der Ballroom Rockets gehören bekannte und weniger bekannte Rock´n´Roll Hits von Elvis bis Chuck Berry, Blues und Rhythm and Blues von Willie Dixon bis Freddy King. Im Focus der Band stehen aber vor allem auch die Schätze der Rockabilly-Ära. Schon fast in Vergessenheit geratene Titel von Künstlern wie Johnny Horten und Jack Earls werden von den Ballroom Rockets wieder belebt und wie damals energiegeladen auf die Bühne gebracht. Was die Show der Band zum Erlebnis macht, ist zum einen die professionelle Performance der Musiker und noch wichtiger die Leidenschaft und der Spaß an der Musik, die auf der Bühne und davor spürbar sind. Die Brüder Fabian (Gesang, Kontrabass) und Christoph Rosmaity (Gitarre) und René Lieutenant (Schlagzeug) spielen Bar-, Club- und Partymusik der besonderen Art: elementar, emotional, rau, tanzbar.